Maybe there us! This is called the "Circboard", and going by the explanation provided on the thing's website, it certainly looks promising. Rather than presenting the user with a replica of an existing keyboard and making them scroll all over it laboriously, it uses a number of circles strung together to form a large circle. 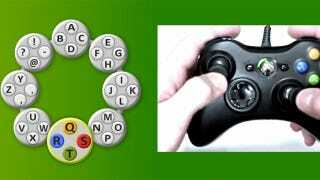 To pick a letter, you move around the large circle with the left thumbstick, then when you're at the letter you want, you select it with a flick of the right thumbstick. Like I said, it looks like it could actually work! Thing is, while it looks similar to the menu and inventory systems of some older games (like Beyond Good & Evil), it looks very similar to a patent submitted in 2007 for a similar method. Hopefully the idea doesn't get bogged down in a legal quagmire, because if it can really make typing on a control pad easier, then it needs to be in gamer's hands soon, not at the end of a lengthy court process.